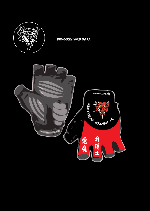 Johan has registered copyright of 16 designs with Copyright House so far. Johan was born in South Africa but now resides in the UK. He is such a multi-skilled individual that I hesitate to catergorize him as anything, for fear of belittling his many other talents! He is a graphic designer, a business consultant, an IT specialist, a photographer, an editor, a locksmith, a magician, a dancer - the list goes on and on. 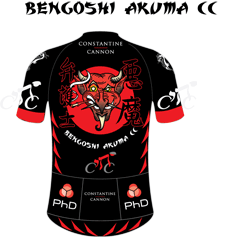 Here are some designs of clothing prints that Johan created for the Bengoshi Akuma Cycling Club, a cycling club consisting of lawyers based in London UK. Multi skilled, Chartered Training Professional & Designer with experience in Training development, Process development and Documentation development in the Training and the Concept to Launch process of major Shoe, Fashion and Performance Clothing brands like Speedo, Berghaus, Lacoste, Ellesse, Boxfresh, Ted Baker, Brasher, Mitre, Kickers, KangaROOS, Clerk & Teller and Red or Dead. Graphics and DTP professional with 22 years experience in the print and design industries. Highly Technical and personable with a knack to speak plain English and see the wood for the trees. Legendary trainer with a stunning track record. Known as a problem solver and a 'Go-to Guy'. An egalitarian that treats everyone the same, no matter what their status, position or ethnicity. Always open to logical argument and loves a good logical process. Lateral thinker. Self-starter and self-motivator. A varied background and lots of experience. Can easily grasp the challenges that others might encounter. Loves helping people and sharing knowlege. Managed 12 Staff and >500 Children, 6-8 years old. RHEMA is the largest Charismatic church in South Africa with a membership exceeding 31,000. 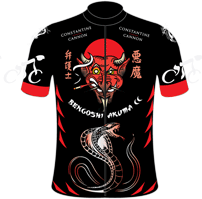 I designed the full range of clothing prints and equipment prints for Bengoshi Akuma Cycling Club. Bengoshi Akuma is Japanese for "Demon Lawyer". They are a cycling club consisting of lawyers based in London UK. 3D Body shapes and templates I created for Speedo™ in 2007-2009 using Poser™. I managed and facilitated a project to change the templates that all their clothing are designed on, using body grids via Illustrator, InDesign and Photoshop. Level 3 & 4 - License to teach in the lifelong learning sector. To become a professional member of the Institute of IT Training, you need to provide evidence of a nationally-recognised certification/qualification, as well as evidence of subject matter expertise, relevant experience, a professional reference, as well as submitting a CPD record at least on an annual basis. Additionally, you will be required to sign up to and adhere to the Institute's Code of Professional Conduct. Activities and Societies: Institute of IT Training Professional Membership as recognised throughout Europe and the UK. The Institute of IT Training is the world's first professional body for IT training professionals.